Pele was born of the female spirit Haumea, or Hina, who, like all other important Hawai'i gods and goddesses, descended from the supreme beings, Papa, or Earth Mother, and Wakea, Sky Father. Pele was among the first voyagers to sail to Hawai'i, pursued, legends say, by her angry older sister, Na-maka-o-kaha'i because Pele had seduced her husband. Pele landed first on Kaua'i, but every time she thrust her o'o (digging stick) into the earth to dig a pit for her home, Na-maka-o-kaha'i, goddess of water and the sea, would flood the pits. 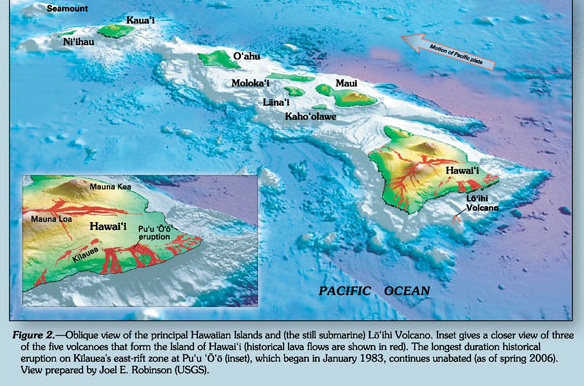 Pele moved down the chain of islands in order of their geological formation, eventually landing on the Big Island's Mauna Loa, which is considered the tallest mountain on earth when measured from its base at the bottom of the ocean. 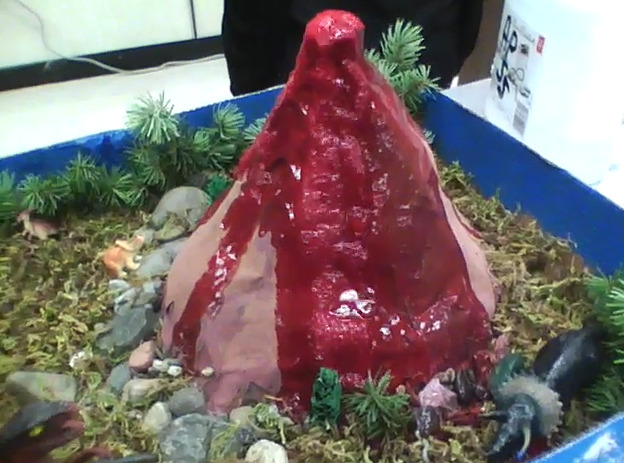 First make the 'cone' of the baking soda volcano. Mix 6 cups flour, 2 cups salt, 4 tablespoons cooking oil, and 2 cups of water. The resulting mixture should be smooth and firm (more water may be added if needed). Stand the soda bottle in the baking pan and mold the dough around it into a volcano shape. Don't cover the hole or drop dough into it. Fill the bottle most of the way full with warm water and a bit of red food color (can be done before sculpting if you don't take so long that the water gets cold). Add 6 drops of detergent to the bottle contents. The detergent helps trap the bubbles produced by the reaction so you get better lava. Add 2 tablespoons baking soda to the liquid. Slowly pour vinegar into the bottle. Watch out - eruption time! The cool red lava is the result of a chemical reaction between the baking soda and vinegar. In this reaction, carbon dioxide gas is produced, which is also present in real volcanoes. As the carbon dioxide gas is produced, pressure builds up inside the plastic bottle, until the gas bubbles (thanks to the detergent) out of the 'volcano'. Adding a bit of food coloring will result in red-orange lava! Orange seems to work the best. Add some red, yellow, and even purple, for a bright display.